GRAND TETON, Wyoming – Photographer and FATHOM contributor Robert Christian Malmberg heads for the mountains with a handmade darkroom trailer in tow. Literally. "Wildﬂowers on the River Bank." 8 x 10 original ferrotype. "Because of the cool fall temperatures, wildﬂowers everywhere had started to wilt. I loved the way they curled at the ends with the weight of the dried ﬂower head. It was strangely comforting knowing they would all be covered in snow before too long." Million Dollar Cowboy Bar — for whisky, competitive pool games, and dancing in muddy boots. Nora's Fish Creek Inn — for country-style breakfast. Sweetwater Jackson Hole — for the best lunch ever. Peruse and purchase prints at robertmalmberg.com. 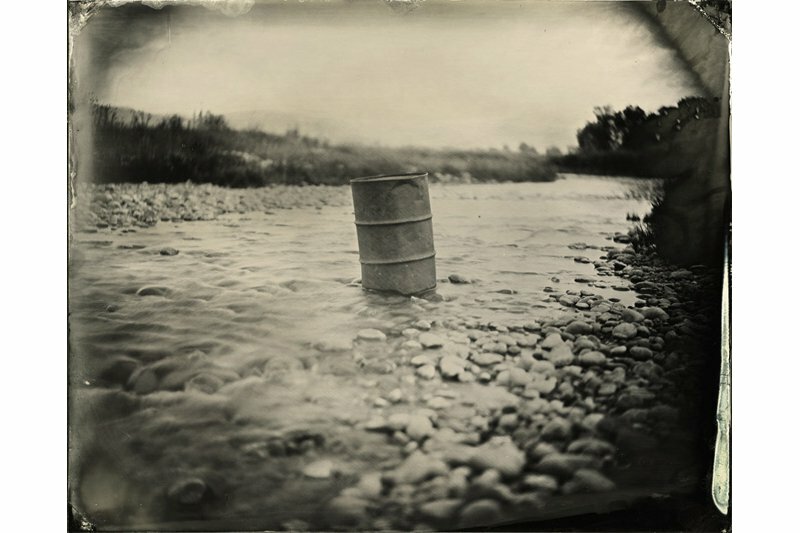 "A Barrel in the Stream." 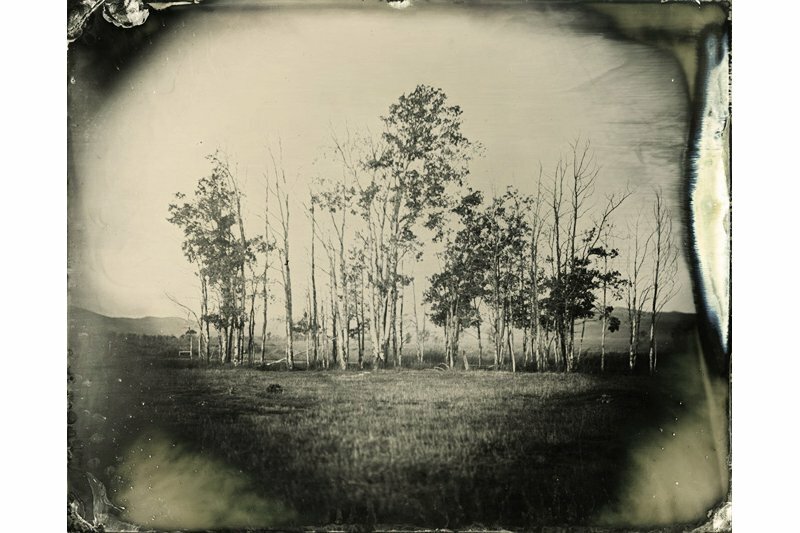 8 x10 original ferrotype. "We were inspired by the natural beauty of the open plains surrounded by Teton National Park. What we end up finding and shooting had deeper meaning: a way of life forgotten in time, the physical artifacts of our our rapid evolution." "Bench Press on a Pile." 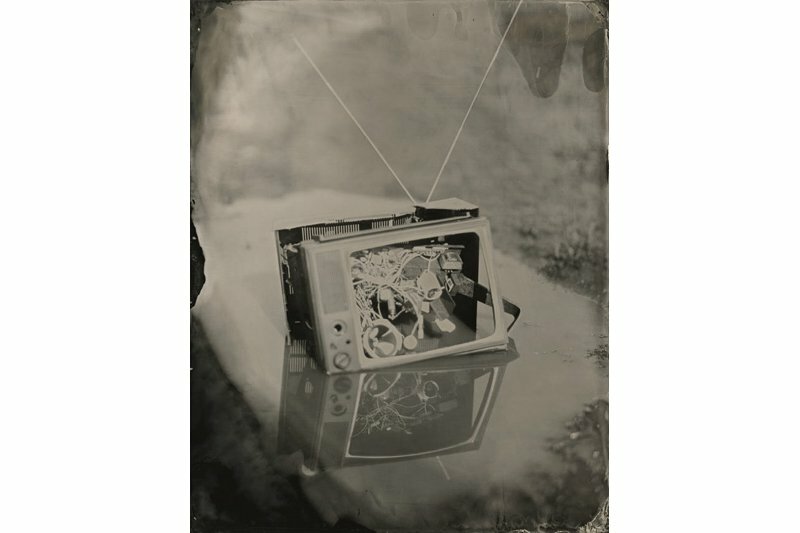 8 x 10 original tintype. "It was funny to decide between making an image of this scenario versus a beautiful snowcapped mountain, as I only had enough chemicals and materials to shoot about five plates per day. This vintage handmade workout device was lying on a heap of mason jars, shrapnel, and rotten strips of wood." "Aspen Trees in Autumn." 8 x 10 original ferrotype. "This row of Aspen trees caught my eye right away. 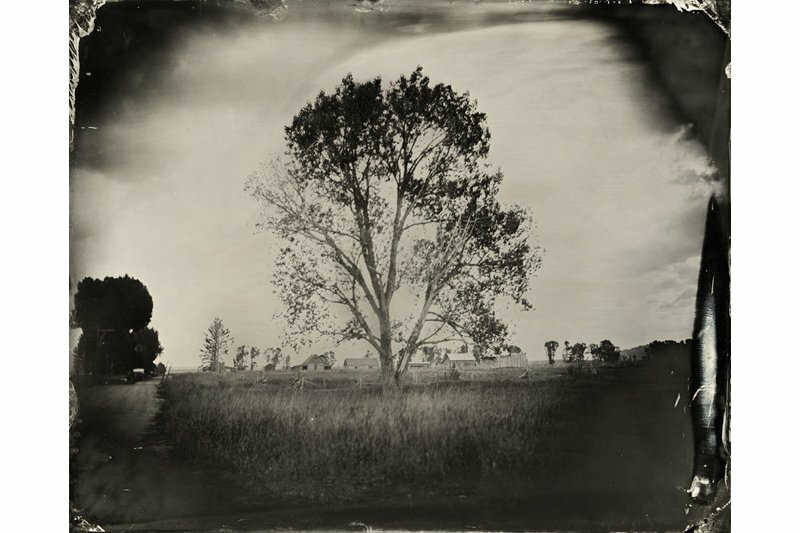 The leaves were a magniﬁcent bright yellow, which renders as a deep shadow tone in the collodion process. The trees took on a life of their own — each with its own personality to offer to the collective grouping." "Television in a Puddle." 11 x 14 original ferrotype. "I tried to photograph these objects as they were found — though I must admit that I styled the rabbit ears to stand up that way! This plate was one of my personal favorites from the project. It says so much about how we've grown technologically over the past couple of decades. We have an insatiable thirst for the next best thing." "Fence Post at Dusk." 8 x 10 original ferrotype. "The title explains it all. This plate was very peaceful to make during the sunset hour with the late-day light shining directionally on an old fence post (most likely hand-built in the 1880's). Notice the Grand Tetons poking through the background." 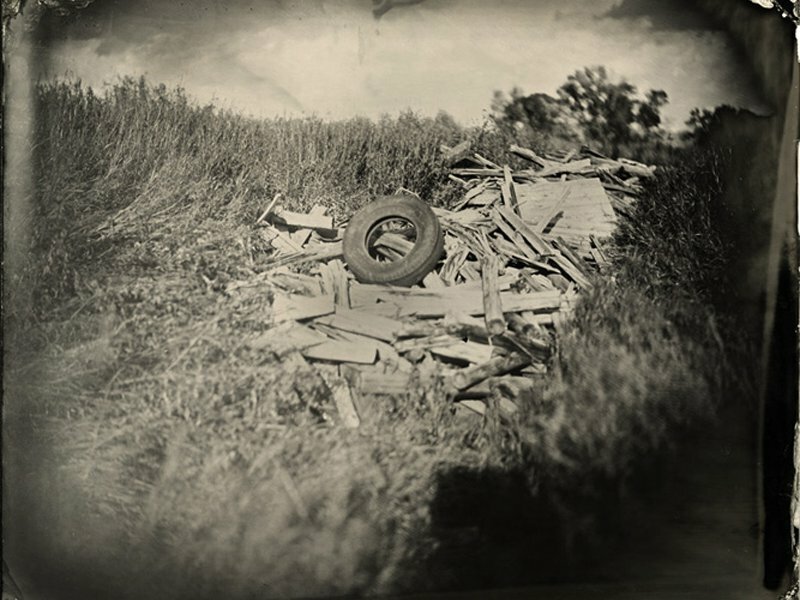 "Tire on Wood." 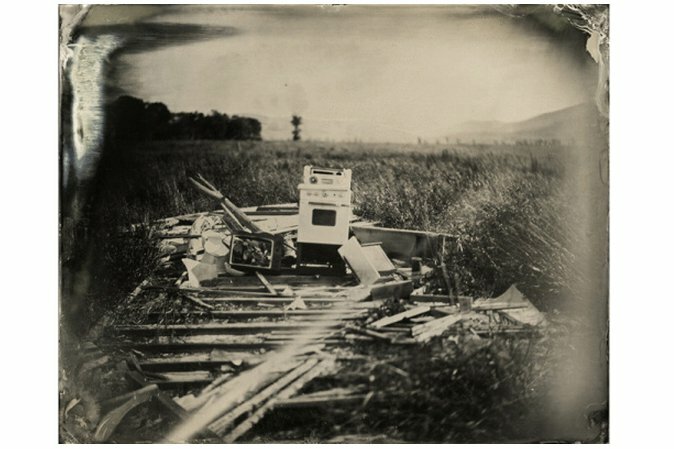 8 x 10 original tintype. "I loved the contrast of the dark rubber against the light wood. The weeds in the foreground are matted down from the body imprints of wild buffalo." "The Lone Tree." 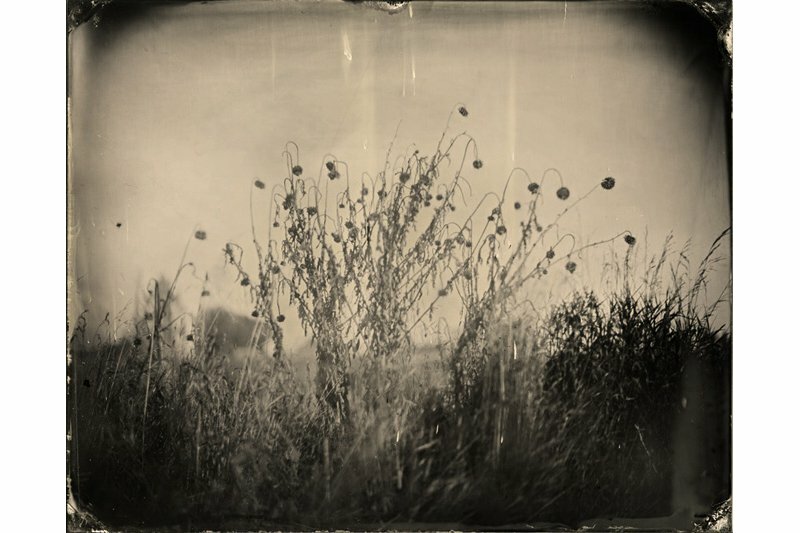 8 x 10 original tintype. "The trees were always amazing. They took on a whole new meaning for me amidst a landscape of collapsed homes and technology graveyards. They are at once a symbol of hope and mechanism of life." Just as winter started teasing the mountain region of the western United States, photographer Robert Christian Malmberg built a mobile darkroom trailer out of a 5 x 8' U-Haul and, along with a colleague, drove seventeen hours from San Francisco to Jackson, Wyoming. 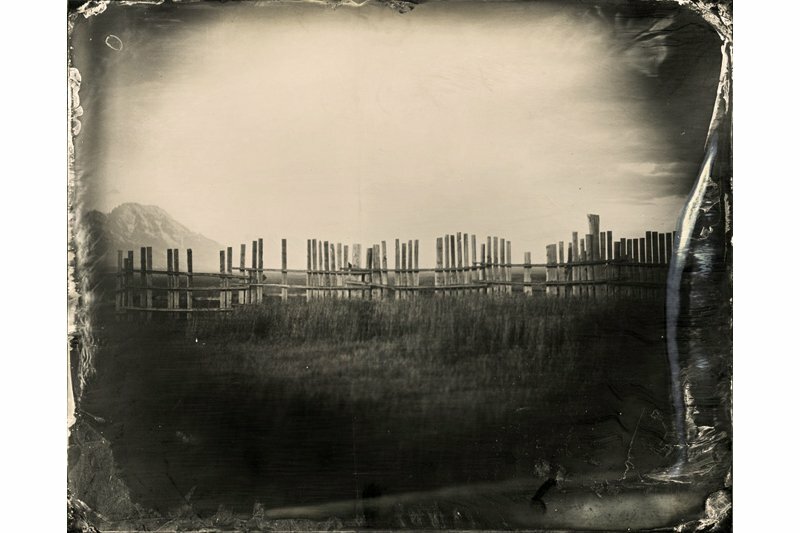 Their initial plan was to shoot Yellowstone and the Tetons in the collodion process (Malmberg's esoteric photography format of choice). But then they came across the remnants of a ghost town in the open plains just outside Jackson — surrounded by the Teton mountain range. Malmberg says, "The images we started producing felt so much richer than the generic nature shots that you see on calendars and postcards." They woke up at 6 a.m. every morning to pull the trailer out into the fields, where they would shoot all day long, producing five to seven plates per day. About the image above, Malmberg explains, "As we wandered through the open plains, we stumbled across this antique oven, which appeared to be intact and surviving the harsh winter climates of Jackson. Had the house collapsed all around it? Who was the family that used this oven to make their meals? Where are they now?" 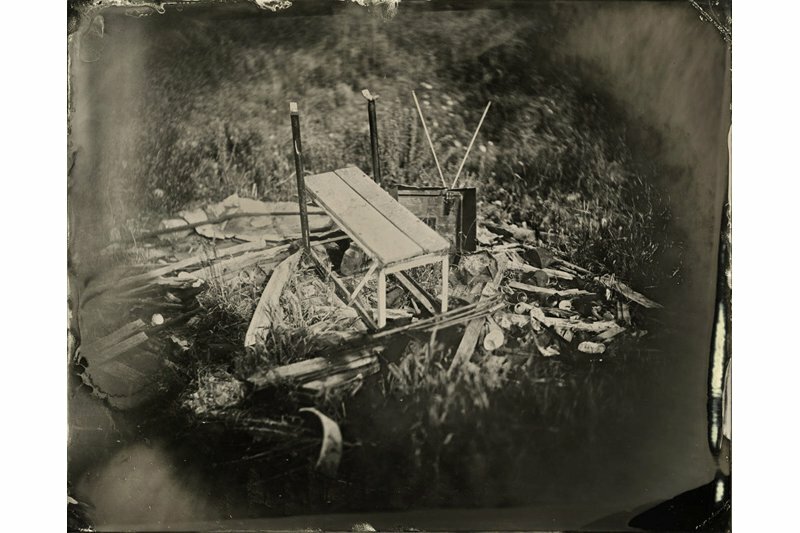 Robert is a photographer, filmmaker, and collodion artist based in New York City. You can see some of his work at robertmalmberg.com and vimeo.com. He travels for the memories, the people, and, of course, the image making. Get to know him better: Read Robert's Fathom Questionnaire.